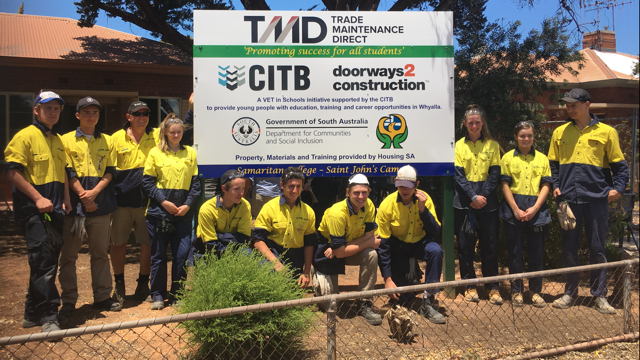 On Tuesday 21 November 2017, a group of Whyalla students visited the house they will be refurbishing as part of the nationally recognised Doorways2Construction (D2C) program that provides hands on construction industry experience to young people. D2C is nationally recognised in the field of construction and as a stepping stone to a wide variety of careers, as well as allowing students an opportunity to gain units towards their SACE. The program provides a hands-on opportunity for students to develop a range of building and repair skills on a vacant Housing SA property in need of maintenance and renovations. All work is certified prior to a new tenant moving into the home. The latest D2C project is a partnership between Housing SA, Samaritan College and the Construction Industry Training Board, and involves 10 Samaritan College students on-site one day a week to carry out a full refurbishment of a Housing SA home. Works are expected to be completed by June 2018 and include plumbing, electrical, concreting, carpentry and painting. Skills the students develop through the project contribute to further study or work opportunities. Housing SA is integral to the program, removing a rental dwelling from the normal stream of vacancy management, then dedicating it to the learning and development project and also supporting the cost of the construction work. Since 2001, the D2C program has seen more than 100 students learn about the construction industry and refurbished 16 Housing SA properties in Whyalla.